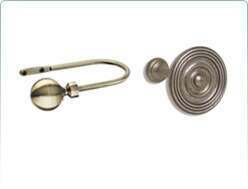 We offer a large selection of bay window curtain pole accessories which include passing brackets and passing rings. The rings simply glide over these support brackets allowing you to hang a pair of curtains in your bay window. Bay window joints for the corners of your bay are available as well as a large selection of decorative finials to beautifully coordinate with all interiors. 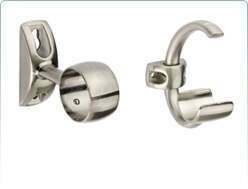 There are 2 types of curtain rings used for bay windows, the first is a standard curtain ring, these are the same as the rings found on many of the straight length poles as well as some of the bay poles. Standard rings will not pass any type of support bracket so an individual curtain will be unable to pull around the corners of a bay (as corners require support). 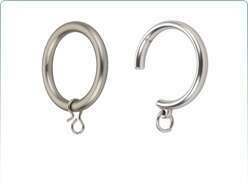 The next type of curtain ring is a passing ring which has a small section cut out of the back, when these rings are used in conjunction with their coordinating passing brackets, the curtains are able to pass the supports. Bay window pole brackets are also available in the 2 types of passing or standard. Many of the standard brackets can be wall or top fixed and have different projections and sizes. The standard brackets listed within this section are either intended for use with bay windows or are supplied as extra brackets for an existing bay window pole, these types of brackets will not allow a curtain to pass. Passing brackets, when used in conjunction with their coordinating passing rings will allow the curtain to pass these supports. Some passing brackets can be wall or ceiling fixed. Bay window corner joints fix between 2 poles and adjust by hand to the angles of your bay. Some corner joints act like a hinge and others are bendable pieces of metal. 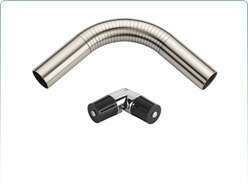 These joints can achieve angles from straight (180 degrees) to a right angle (90 degrees). 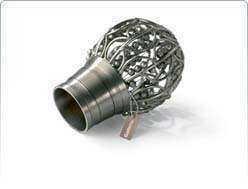 All finials within this section are intended to fit our existing bay window curtain pole kits, made to measure bay poles, or bay poles which can be made from mix and match components. Our curtain holdbacks listed within this section are again intended to coordinate with our bay window curtain poles whether they are pole kits, made to measure bay poles or mix and match. 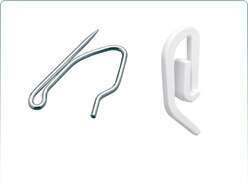 Here you will find all types of curtain hooks to fix curtains to the curtain rings.